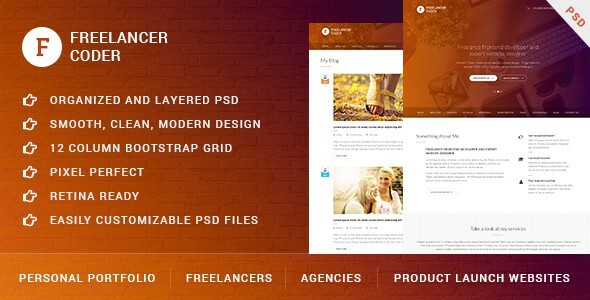 Freelancer Coder one page portfolio PSD template is based on 12 column responsive Bootstrap grid. This PSD template is best suitable for personal portfolio, small business websites, freelancers, creative studio and product launch websites. Freelancer Coder is made for those in need of professional looking website for their business. This is a creative yet modern and professional design to make a stand out site and you can present your established or startup business with ease. I have created these PSD templates after researching and working constantly to make the smallest details in the design perfect. This is PSD template only. There are no HTML or any kind of theme included with this item. Any images, logos, icons or media used in previews are not included in this item. In case you want to use them in your commercial or non commercial site then you will need to contact their authors/owners to grant permission for that (Although all assets including fonts and images are available for free download using links provided in above section – Source and Credits). After purchasing design please read help file for more details. Thank you so much for your interests. Your comments and ratings would be much appreciated. If you purchase this PSD template and have any troubles then please feel free to connect with me from my profile here. I will update this template time by time and I want to hear your wishes for the future updates or for complete new templates.